Since 2012, hundreds of men and women have left Western countries to join jihadist groups fighting in Syria. Many are still there, many have been killed, but some have chosen to return to their countries of origin. French Journalist David Thomson met some of those who came back. Bilel, Yassin, Zoubeir, Lena, each has a different profile and story. Some have returned disgusted by the violence of the Syrian battlefields, or the terrorist attacks that have struck across Europe; they try to become forgotten, living under extreme surveillance. Others return seriously wounded or psychologically destroyed. Others still are in jail, a breeding ground for broader radicalization. 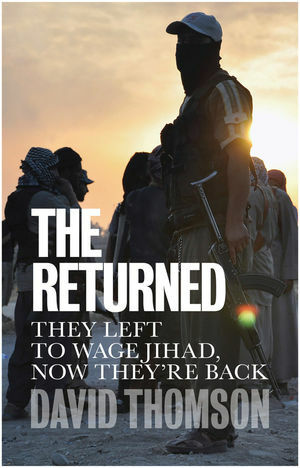 And some have come back to continue to carry out jihad in Europe. In utmost secrecy, David Thomson gathered their testimonies and recounts them in this remarkable and revealing book. With ISIS losing ground on all fronts, the steady flow of jihadists returning to Europe represents one of the greatest challenges facing countries across the continent. This nuanced analysis of the social, religious, political, familial and psychological factors that push people to violent extremism is more necessary now than ever. It will be essential reading for all those seeking to understand how we might address this threat. David Thomson is a journalist who reported on the Arab Spring and war in Libya for Radio France Internationale. His work was recognised with the 2016 Grand Prix de la Presse Internationale, awarded by the French Association of Foreign Media (APE). "Thrilling... a major contribution to the debate." "A unique and illuminating work on this unsettling subject."